Last Thursday, I spent a very pleasant day attending "Producer Training" at the Oklahoma Food Coop. 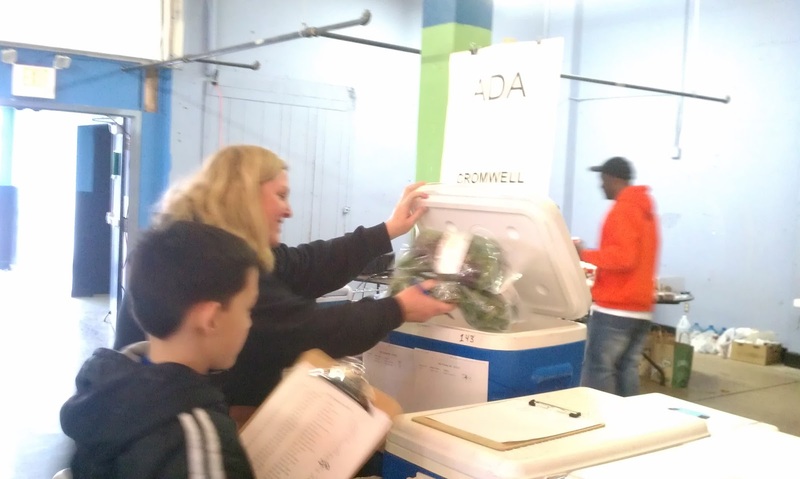 What an amazing feat of logistics they accomplish every month to get fresh local food sorted and delivered to locations around the state so members can take advantage of the healthy bounty Oklahoma has to offer. Sarah (right) from the Coop and Angela from Dream Acres Farm. I attended orientation with Angela from Dream Acres Farm. Sarah conducted the orientation. To be honest, the place is a little overwhelming. I'm not sure photos capture it. We got a chance to see how all the different products get sorted. We also spent four hours helping sort products into coolers for delivery (mostly) later the same day. Brandon takes in frozen food deliveries from producers. The most impressive part of the operation has to be their handling of frozen meats and other prepared foods. I didn't think to get a photo when a bunch of farmers were lined up with their giant coolers. There is no question the food is coming from real farmers and ranchers (complete with cowboy hats and work boots). Each producer checks in his or her deliveries, already sorted and labeled by customer and location. 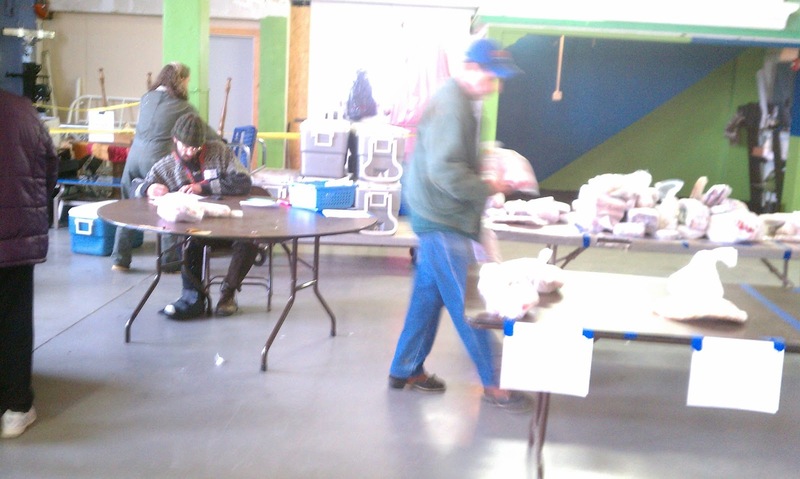 A volunteer takes the frozen foods off of Brandon's table and sorts them on the folding tables on the right. Those hanging pieces of paper list up to four towns where deliveries are made. Luke was my partner for most of the day sorting meats. 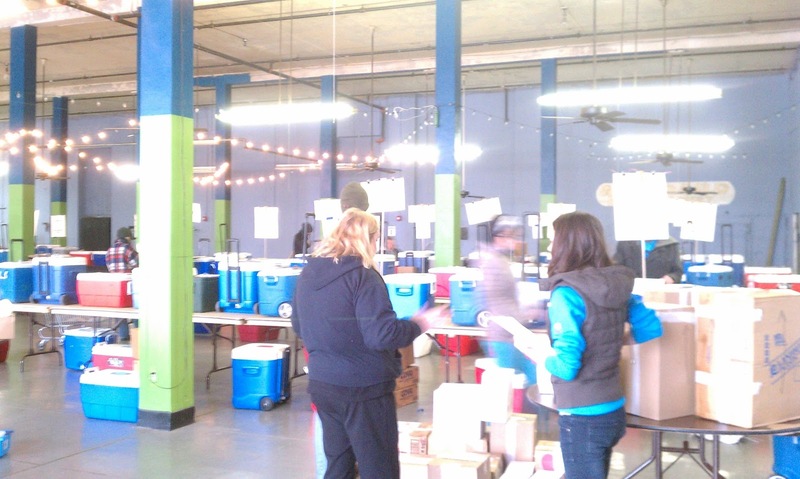 Other volunteers take the piles of frozen goods in shopping carts over to the coolers to sort and record what is stored where. Luke and I spent most of the day sorting meats. As you can see from the winter coats and hats we were all wearing, it is cold in the warehouse! A particularly nicely packaged piece of meat. 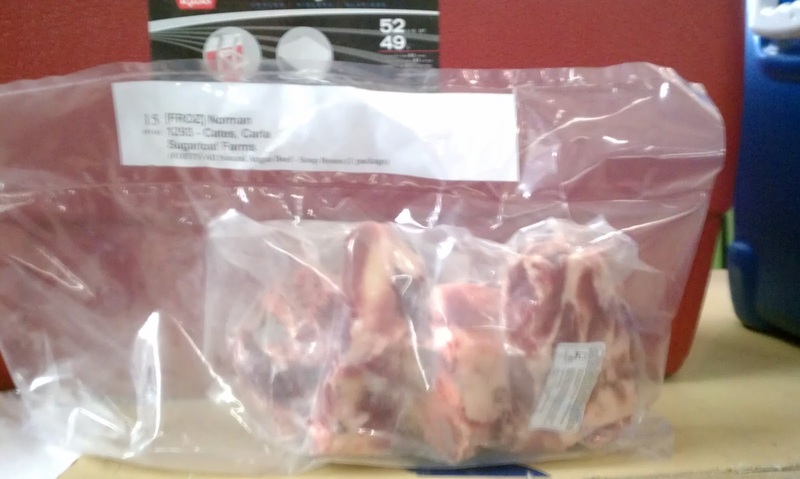 I took a photo of this package because I liked how the producer packaged the meat. The label is easy to see and won't come off or smear if it gets wet in the cooler. Brown paper wrappers were my second favorite. Reused plastic grocery bags were a distant third. Angela and Isaac sorted produce. Volunteers (other than producers going through orientation) get credit towards the purchase of food, based on how many hours they work. It is a much better deal to work at the coop to earn the credit because no taxes are taken out of the "work credits." 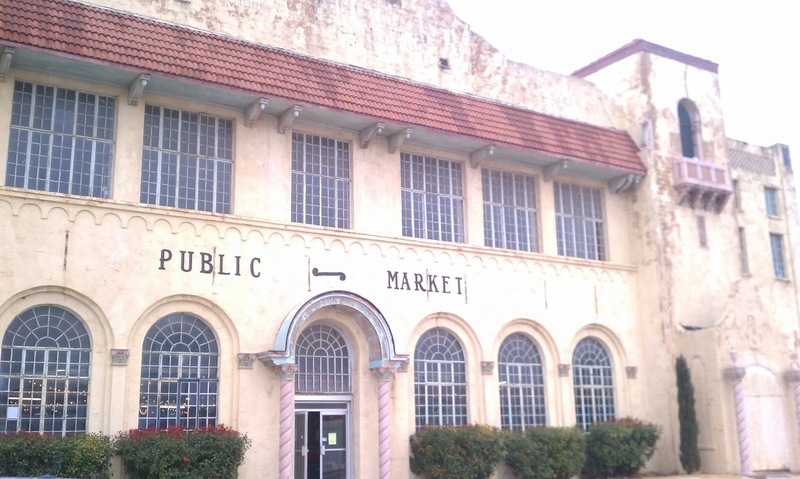 The Public Market Building on S. Klein is where the Central OKC pickup takes place and where we sort all the goodies. 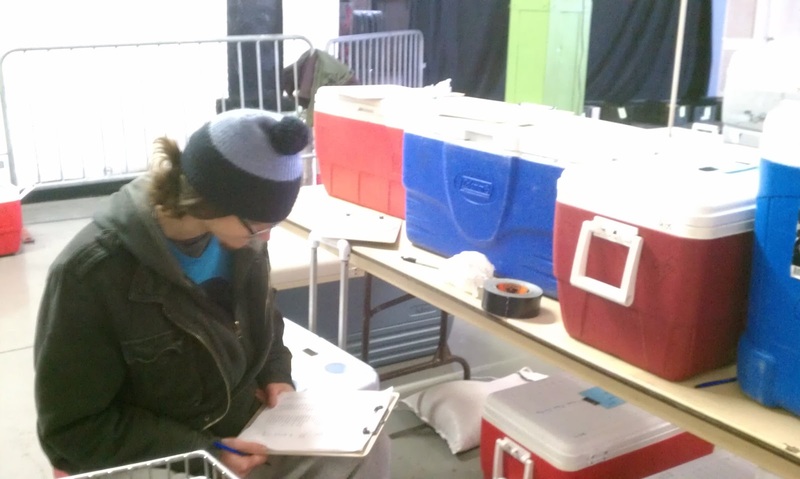 A volunteer inventories eggs (very carefully, of course). 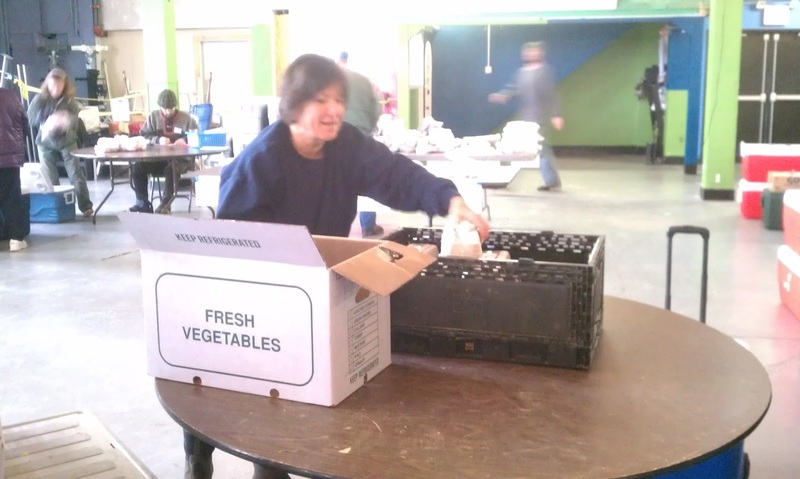 A volunteer sorts produce by city. You can't really read it, but each of those white posters above the coolers has a name of a delivery point. 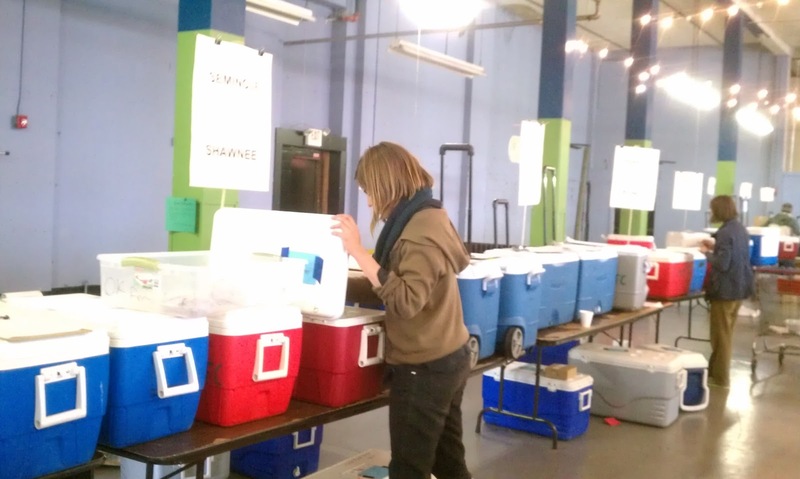 The volunteer above is making sure the kale ordered for a customer to pick up at that location is in the right cooler. That row of coolers looks like it stretches on forever, but there are 8 or 10 more rows of coolers! Thanks to the folks at the Oklahoma Food Coop for a very interesting Day. We will meet up again on Saturday (March 2) for the Membership Meeting.